Dixie Kelley Newell, age 96, went to be with her Lord and Savior Jesus Christ on Thursday, September 06, 2018 surrounded by her loving family. 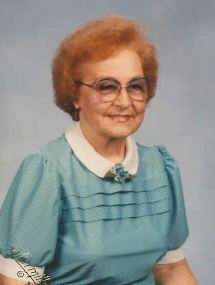 She was born on March 05, 1922 to the late Jim and Ida Crowe Kelley. She was a member of the Dayton First Baptist Church. She was a retired Licensed Practical Nurse, having worked at Rhea Medical Center, Rhea County Nursing Home and home health in Georgia. Home health was her favorite type of nursing because it brought her in contact with not only the patient but the families also. She loved gospel music and writing poetry and never lacked for a subject with most poems showing her sense of humor. Most involved other people and there was always a lesson involved for whoever read her poems. Many of her poems were about her Lord. She was preceded in death by one son, Ronald Allen Newell; four brothers (infants J.E. Kelley and Earl Dean Kelley), J.R. (Red) Kelley, Baxter Kelley and three sisters, Geneva Hicks, Ruby Roberts and Trudy Couch. She is survived by her children, David (Diana) Newell of Soddy Daisy, TN, Thomas (Alice) Newel of Suwanee GA, Linda Newell of Dayton, TN, Randy (Gail) Newell of Dayton, TN; brothers, Elbert Kelley and Rev. Donald Kelley both of Chattanooga, TN; 11 grandchildren, Keith, Krista, Michael, Charlene, Brian, Todd, Sarah, LeAnn, Jeff, Kevin, Tonya and numerous great grandchildren, great-great grandchildren, nieces and nephews. The family would like to say thank you to Dr. Tom Bovine, Dr. Dan Logan, Choices of Tenn., all the ladies at Eagle Home Health Care, Amedisys Hospice Staff and all other caregivers for all their love, support and care of Dixie for many years. Service will be 2:00pm Sunday, September 09, 2018 in the Chapel of Coulter Garrison Funeral Home with Rev. Milton Knox and Rev. Clyde Fitzgerald officiating. The family will receive friends Saturday, September 08, 2018 from 5:00-8:00pm. Interment will be in Smyrna Cemetery.